This is going to sound like bragging because it is bragging. It’s also an elaborate apology/excuse for using a ton of disposable partyware. send Tobias on a long-planned ski weekend with his brother. He left on Friday night and came back Sunday, tired and happy. finish the leftover salmon sandwiches and make a good dent in the leftover chocolate fondue. We also consulted with Max’s cardiologist to change his medicine to something that might do a better job of preventing the tachycardia episodes, and we are very happy that doubling the dose of his beta-blocker doesn’t seem to prevent him from having fun climbing walls and kicking around in the swimming pool. German birthday party: When kids ask for normal water they mean sparkling. I was chastised by three different kids for not having a trash receptacle on the table (what do we do with our strawberry stems?) 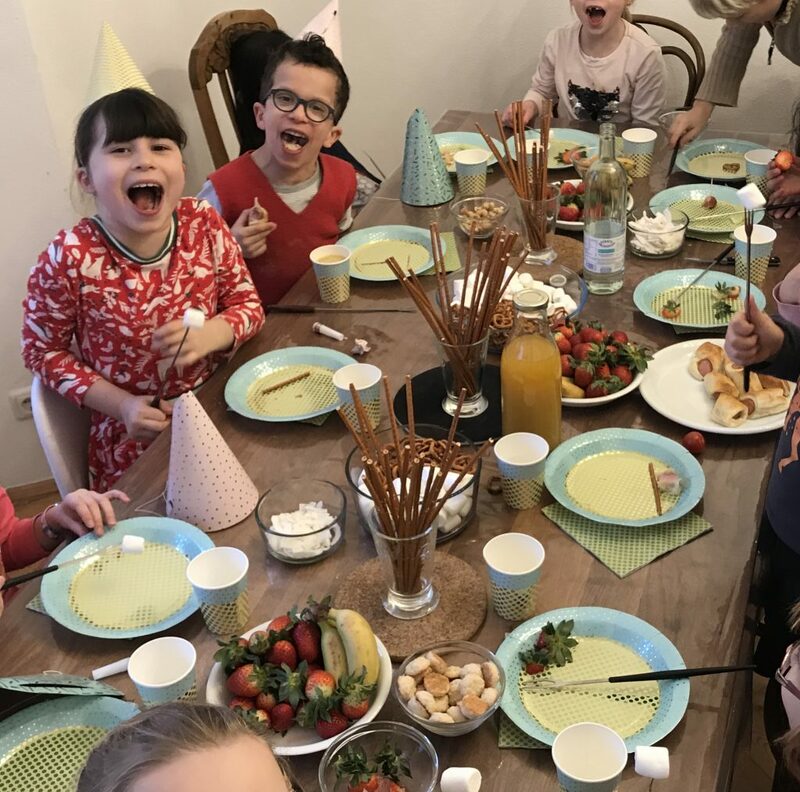 12 kids + 12 fondue forks = 0 disasters. Whew. I tried to convince them to dip a pretzel in the chocolate (not pictured) and failed. Your loss, kids! There’s so much to cringe about in this picture: paper plates and paper cups and single-use everything, plus out-of-season strawberries plus bananas. Really, though, it’s a picture of two kids I love having a wonderful time. Disposable party supplies are crap except that they really remind you to live in the now! I feel so proud of my family for pulling it together and focusing on the things we CAN do instead of the things we can’t, and when/if I fold some of the week’s laundry I am going to feel absolutely triumphant. Here’s a post without swearing! You’re welcome! …artichokes. Bushes full of them. Tobias and I met randomly at an airport baggage carousel and knew each other for about six months before we started getting serious about trying to start a family. We met in 2009, moved in together in 2010 and started IVF, got pregnant in 2011, had one kid in 2012 and another in 2013, moved to Italy in 2014; the milestones flew by amid parental loss and stints in the children’s hospital and new countries and new languages – it was hard to tell who we were as people amid all the newness and the stress. Imagine my relief, then, when, after a minute’s search for a bag big enough for all of the artichokes I planned to cut, I walked toward the artichoke patch – lack of kitchen be damned – and saw Tobias coming toward me, arms full of a family’s worth of freshly-cut artichokes. We, Tobias and I, are a people confident in our logistical skill, able to change plans when we see an opportunity, ready to celebrate the goodness of the moment, ready to cook 8 artichokes on the grill and then go downstairs to the laundry sink to clean the dinner dishes. A dishwasher’s a lot more fun if you haven’t had one for a while, and when I compare the best times in my life to the list of ‘wants’ in my head, they don’t add up. I don’t want a kitchen, really, I just want to cook delicious food for my family. I don’t want a nice house, I want to be safe and warm and comfortable. I don’t want the perfect husband, I want one who will make a couple of silly decisions and then have fun living, really living, with the consequences. Hurrah for artichokes! Hurrah for flexibility! Hurrah for kids who are happy to eat on the floor.